VaeVictis sent this narrative about an important battle in Spain’s 13th century Reconquista history, the history Islam is so anxious to re-write. Unfortunately VV emailed the story to Gates of Vienna while the Baron was at the Brussels Conference; his essay was subsequently buried in the tons of correspondence that came in during that period. It was only his courteous reminder yesterday that made me realize I’d passed right by the timely commemorative post I’d planned. Thus, as wtih many of my good intentions this story is being published later than I’d have liked. But what the heck — I’m already infamous by now for my tardy thank you notes, belated birthday cards and wilted bouquets — why change my s.o.p. this late in the game? Besides, in the shadow cast by eight centuries, what’s an extra week? It’s still a good story even though the present-day revelers have long since returned home to plan for next year. At least I hope there’s a next year for Las Navas de Tolosa. Who knows how long they’ll be permitted to continue commemorating this hinge of history? 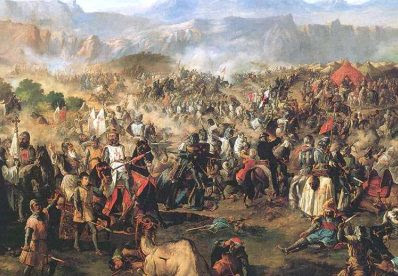 July 16th 2012 marked the 800th anniversary of one of the greatest of the Spanish reconquista confrontations: the Battle of Las Navas de Tolosa. This crucial encounter pitted the combined might of the Almohad Empire against the disparate Christian kingdoms of Spain. The result was a spectacular triumph on the Spanish side. In honor of this momentous victory the city of La Carolina, where the famous battle took place, has always hosted commemorative festivities to mark the occasion. However, with the increasing incursions of political correctness into Spanish culture this event has now been deemed unseemly and excessively nationalistic by certain elements of the Spanish establishment. Therefore no government representatives from the central, provincial or autonomous regions were present. Nor do members of the Spanish royal family any longer attend. Only the government of Navarre continues to support the occasion and to send representatives to commemorate one of the most important battles in Spanish history. On the night before July 16 1212, a patchwork coalition of Spanish kingdoms and military orders secretly made their way over a little- known mountain pass to emerge by morning on the plains of Tolosa. Here a massive Almohad army numbering some 200,000 had occupied a strong defensive position. This immense force had been levied from across the entire breadth of the Almohad Empire by the Caliph al Nasir. Most were from the Almohad’s North African possessions including the modern countries of Morroco, Algeria, Tunisia, Mauretania and going as far south as Senegal. There were also contingents of Andalusians, Iberian Muslims born and bred in Europe, and fanatical volunteers from various corners of the Muslim world. The Christian force was comprised mainly of the kingdoms of Castile, Navarre and Aragon led by their respective kings Alfonso VIII, Sancho VII and Pedro II. In addition there were significant numbers of zealous military orders, the knights of Santiago, Calatrava and Templars being the most prominent. An official papal Bull had been issued declaring this to be a Crusade, but by then most of the European crusaders had long since abandoned the pushback against Islam’s incursions. In the end, they did little more than pillage the Jewish quarter of Toledo before turning back across the Pyrenees. Thus the remnant was a patchwork army of Christian kingdoms who had often been at war with each other; they had little experience combining their respective forces into a single cohesive entity. Nonetheless the threat posed by the Almohad invasion was understood to be severe enough to force the temporary coalition of this varied group. Although the Spanish army had surprised the Almohads entering the plains of Tolosa by night, the battle itself would come as no surprise. By daybreak the two armies had already arrayed themselves in a face off. After the requisite preparations the Christian trumpets and Muslim atabals signaled the commencement of battle. In the center King Alfonso and the Castilian troops — as well as members of the military orders — pressed forward, eventually smashing their way to al Nasir’s bodyguard. Here they were confounded by a wall of 10,000 African slaves armed and chained together. For the Castilians it seemed there was no way to break through. However, it was to be the Navarrese, led by Sancho VII, who discovered a way to pass through the chains. Once through they raised their banner from the other side. The slave wall surrounding al Nasir was itself encompassed and cut to pieces, forcing al Nasir to flee the battlefield. The remaining Almohad army was massacred in the tens of thousands, resulting in the annihilation of the Caliph’s army. The might of the Almohad Empire had been effectively shattered. The enormous cost of mobilizing that massive force from every corner of the empire, only to suffer defeat at the hands of the Christians was both a military and a fiscal disaster. Even more importantly the battle served as a catalyst for the massive Christian territorial gains that would follow in the remainder of the 13th century. By 1238 Cordoba, the traditional seat of the Caliphate, had been captured as had Valencia, Trujillo, Caceres, Badajoz, Merida, Medellin, Andujar, Baeza, Majorca and Ebiza. Within another decade Seville, Murcia, Niebla, Carmona, Jaen, Ecija, and Porcuna had also been conquered by the Christian armies. With the close of the 13th century their reconquista would founder for a time as the Christian kingdoms fought amongst themselves over the boundaries and sovereignty of rulers in the expanded territories. The remaining autonomous Muslim lands would become known as the Kingdom of Granada and would survive until 1492. The effect of Las Navas resonates most strongly among the Navarrese whose flag and coat of arms bear symbols of the battle to this day. The interlocking golden chains represent the chained slave-wall defenses around al Nasir. The red field symbolizes the red velvet of the Caliph’s tent. According to legend the green emerald in the center was the only piece of booty Sancho VII kept from the battle, leaving the rest to his troops. Sadly, commemoration of this battle for Spanish independence is considered politically incorrect by the Spanish government. Yet surely the irony of the fact that this battle is what made possible the existence of the very government now too timid to join in its commemoration is not lost on those who benefitted? This July only the government of Navarre was still willing to stand forward to proudly recognize and commemorate that July day eight centuries ago, when their heroic predecessor Sancho VII bravely stood and fought to regain the lands Islam had taken. This time around, Islam’s soldiers seldom need to pick up a sword in the home of the West to make its citizens flinch. We are, as the Muslim Brotherhood demonstrates repeatedly, only too willing to destroy our miserable houses with our own hands. For information on the activities held this year to commemorate Las Navas de Tolosa go here. One wonders how long Navarre will be permitted to continue honoring its past. Any chance you could publish a Counterjihad Calendar with Counterjihad feasts and fasts marked in it? So many of these important events are unknown, even to many counter-jihadists. It would be great to compile a list by date/country. The Spanish government may feel embarassed by its own culture and history, but surely many more Europeans feel embarassed by their PC governments. I'd love to attend some of these events and I'm sure many others would too. Its the same here in Austria. Not a single official ever takes part when it comes to commemorate the victory over the Turks in 1683 at Vienna. Islam is such an honorable and valiant tribe. They hold each individual soldier in high esteem. Especially the 10,000 black slaves that were chained together, probably without weapons to defend themselves, that provided a circle of protection around the leader. Islam makes me sick to my stomach. as the forces of Islam tried to carry out campaigns (plural) of conquest throughout Europe. I'd like to see those FACTS in the History O level (or whatever they're called nowadays) curriculum throughout Great Britain. Another sad step along the way to the West's self-dhimmitude. As we celebrate another feast day of St James the Greater, also known in Spain as Santiago Matamoros, St James the Moor-slayer, I've seen pictures of the statues of St James around Spain that hide the dismembered heads of the Moors slain in combat under a blanket of flowers, lest the original statue base offend the usual suspects. I love this article. The anniversary of the Spanish victory should be celebrated not only in Spain, but throughout Europe. It's sad that the memory of this event is being downgraded nowadays, like so many other of our cultural highlights. Musn't express pride in who we are or where we came from, it might offend the Muslims (what Muslim country on earth gives a damn about not offending us? ).